The femur is the longest and heaviest bone in the human body. It consists of a superior or proximal end, a shaft, and an inferior or distal end (see the image below). The superior end of the bone is the articulating side of the femur to the acetabulum. The upper femoral epiphysis closes by 16 years of age. 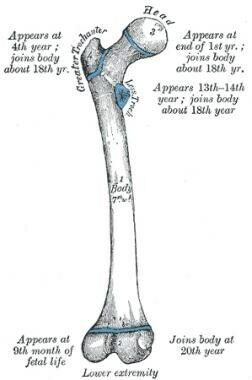 The trabecular bone configuration in the proximal femur obeys Wolff's Law, which states that bony structures orient themselves in form and mass so as to best resist extrinsic forces. The principal compressive group, the principal tensile group, the greater trochanteric group, the secondary tensile group, the secondary compressive group, and, finally, Ward's triangle can be found. The superior end of the femur consists of a head, a neck, and greater and lesser trochanters. The head of the femur is angled superomedially and slightly anteriorly when articulating with the acetabulum. The head is attached to the femoral body or shaft by the neck of the femur. The superior border of the neck begins just lateral to the femoral head and ends distally at the greater trochanter. The inferior border of the neck begins lateral to the femoral head and extends to the inferior trochanter. The superior border is shorter and thicker than the inferior border. The anterior surface of the neck is rough in comparison to the smooth femoral head. The neck’s posterior surface has a concave appearance. The head and neck are at an angle of 130º (± 7º) to the shaft. The angle is larger at birth and decreases with age. The greater trochanter is a bony prominence on the anterolateral surface of the proximal shaft of the femur, distal to the femoral neck. 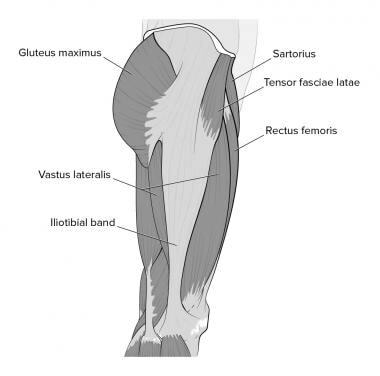 It serves as the insertion site for the gluteus medius and gluteus minimus. The lesser trochanter is a bony prominence on the proximal medial aspect of the femoral shaft, just distal to the femoral neck. 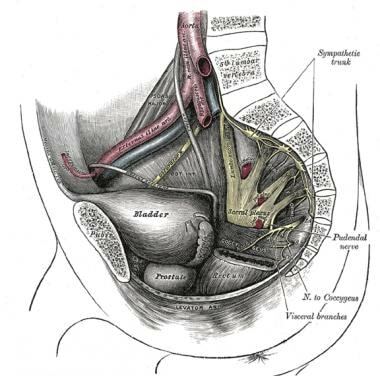 It serves as the iliopsoas insertion site. At birth, each pelvic half consists of 3 separate primary bones: the ilium, the ischium, and the pubis (see the images below). These bones are joined by hyaline cartilage. Pelvis and acetabulum, with muscle attachment sites. The ilium is the largest part of the hip bone and makes up the superior part of the acetabulum. The ala provides an insertion point for the gluteal muscles laterally and the iliacus muscle medially. Anteriorly, the ilium has an anterior superior iliac spine (ASIS); inferior to this is an anterior inferior iliac spine. From the ASIS, anteriorly, the iliac crest comes around laterally and continues posterior to the posterior superior iliac spine (PSIS). The PSIS marks the superior point of the greater sciatic notch. The ischium is the inferior aspect of the pelvis. The superior part of the body of the ischium fuses with the pubis and ilium, forming the posteroinferior aspect of the acetabulum. 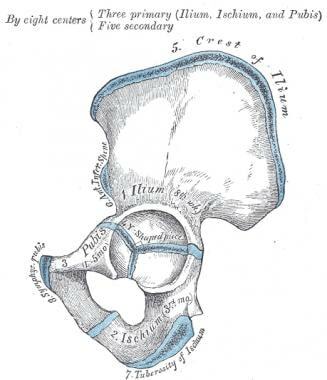 The ramus of the ischium joins the inferior ramus of the pubis to form a bar of bone called the ischiopubic ramus, which constitutes the inferomedial boundary of the obturator foramen. 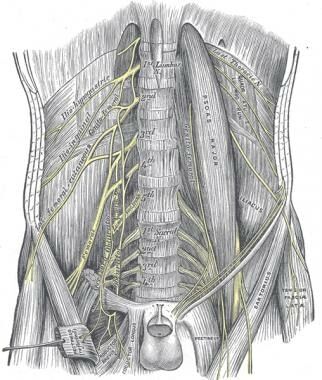 The posterior border of the ischium forms the lower margin of a deep indentation the greater sciatic notch. The large triangular ischial spine at the inferior margin of this notch is a sharp demarcation separating the greater sciatic notch from a smaller rounded inferior indentation called the lesser sciatic notch. The pubis makes up the anteromedial part of the hip bone and contributes the anterior part of the acetabulum. The pubis has a flat body and 2 rami: superior and inferior. Medially, the symphyseal surface of the body of the pubis articulates at the pubic symphysis with the surface of the body of the contralateral pubis. The anterosuperior border of the united bodies and symphysis forms the pubic crest. The pubic tubercles, small projections at the lateral ends of this crest where the inguinal ligaments attach medially, are extremely important landmarks of the inguinal regions. The posterosuperior aspect of the superior ramus of the pubis is called the pectin pubis. As indicated above, the acetabulum is formed from parts of the ilium, ischium, and pubis. The acetabulum is the cup-shaped socket on the lateral aspect of the pelvis, which articulates with the head of the femur to form the hip joint. The margin of the acetabulum is deficient inferiorly. An additional fibrocartilaginous margin of the acetabulum is referred to as the acetabular labrum. The labrum functions to deepen the acetabulum, thus holding the femoral head more securely. The lunate is the articular surface of the acetabulum to the femoral head. The rough depression in the floor of the acetabulum is the acetabular fossa, which is continuous with the acetabular notch. 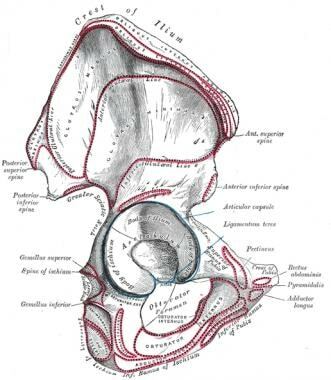 The transverse acetabular ligament is located along the inferior aspect of the acetabulum; it prevents the femoral head from moving inferiorly by deepening the acetabulum inferiorly. 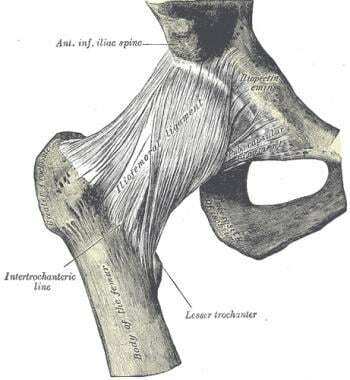 The hip joint contains a strong fibrous capsule that attaches proximally to the acetabulum and transverse acetabular ligament and distally to the neck of the femur anteriorly at the greater trochanter (see the image below). Posteriorly, the fibrous capsule crosses to the neck 1-1.5 cm proximal to the intertrochanteric crest. Most of the fibers go from the hip bone to the intertrochanteric line, but some deeper fibers go around the neck, forming the orbicular zone, which holds the femoral neck in the acetabulum. 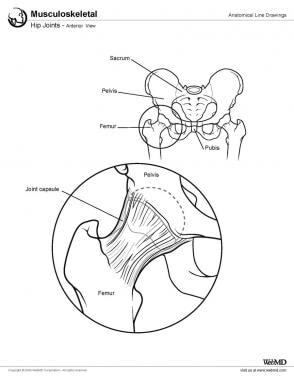 The anterior capsule of the hip is the strongest and thickest part. This capsule is composed of 3 ligaments. The iliofemoral ligament, sometimes referred to as the Y ligament of Bigelow, attaches to the anterior inferior iliac spine and the acetabular rim proximally and takes an inferolateral direction to insert on the intertrochanteric line distally. It is the strongest part of the capsule. The iliofemoral ligament prevents hyperextension of the hip joint during standing by holding the femoral head within the acetabulum. 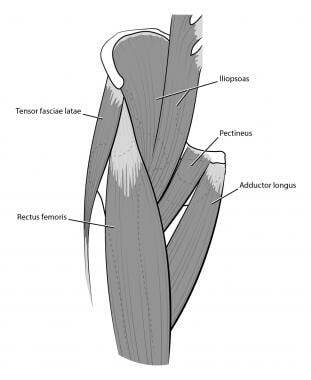 The ischiofemoral ligament reinforces the capsule posteriorly. It originates on the ischial part of the acetabular rim and spirals superolaterally to the neck of the femur, medial to the greater trochanter. This ligament, like the iliofemoral, also prevents hyperextension and holds the femoral head within the acetabulum. An iliopectineal bursa lies anteriorly over the gap in the ligaments, beneath the iliopsoas tendon. There are several additional structures of importance related to the fibrous capsule. Lining the fibrous capsule is the synovial membrane. It covers the neck of the femur between the attachment of the fibrous capsule and the edge of the articular cartilage of the head; it also covers the nonarticular area of the acetabulum, providing a covering for the ligament of the femoral head. 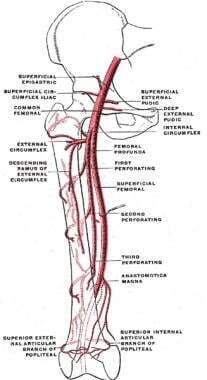 Retinacula, which contain blood vessels, are deep longitudinal fibers of the capsule that go superiorly from the femoral neck and blend with the periosteum. The bursa is considered the synovial extension beyond the free margin of the fibrous capsule onto the posterior aspect of the femoral neck. A fat pad in the acetabular fossa is covered with synovial membrane. It fills the acetabular area that is not filled by the femoral head. Koval K, Zuckerman J. Femoral neck fractures. Handbook of Fractures. 2nd ed. Philadelphia: Lippincott Williams & Wilkins; 2002. 176-177. Moore K, Dalley A. Lower limb. Clinically Oriented Anatomy. 4th ed. Baltimore: Lippincott Williams & Wilkins; 1999. 504-613. Thompson J. Pelvis. Netter’s Concise Atlas of Orthopaedic Anatomy. Teterboro, NJ: Icon Learning Systems; 2002. 182-190.